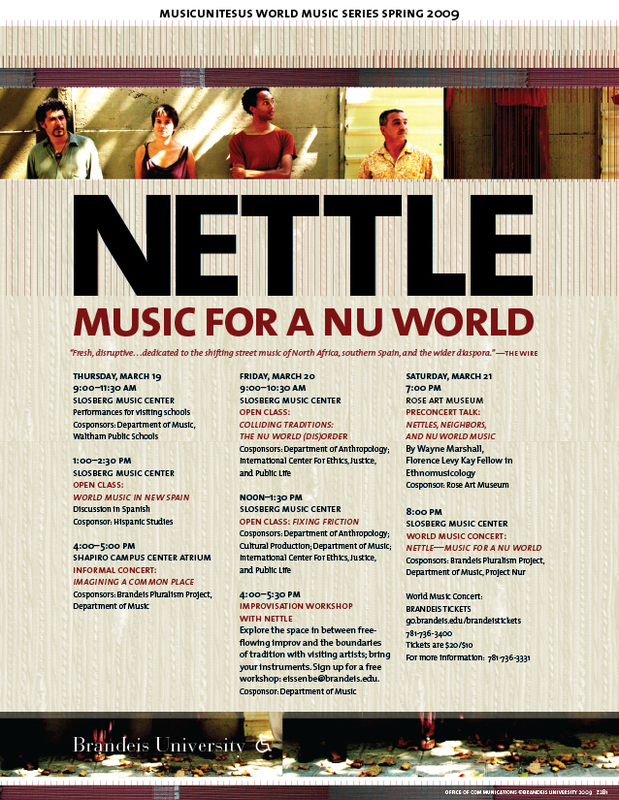 At a time when the arts community at Brandeis is feeling rightly beleaguered, it brings me no little satisfaction to know that we will be putting on a rather art-ful residency later this month, sponsoring the US premiere of such an exciting, provocative, and relevant group as Nettle. It brings added satisfaction that we’ve been able to pull this off at all, especially since we thought we had to call it off back in October. We have some dedicated fundraisers and generous donors to thank for that. For those who don’t know, Nettle is the brainchild of Jace Clayton (aka DJ /Rupture), someone who is no stranger to readers of this blog. He started the group when living as an ex-pat in Barcelona along with several other ex-pats (from Scotland & Morocco), all of them speaking second or third languages in order to converse with each other. There’s a lot to like about the group, starting with their unique sound but branching out into the myriad questions their collaboration seems to pose about cultural & social life in our contemporary, globalized cities. Nettle originated in my fascination with the concept of an album heavily influenced by Middle Eastern ideas, but not necessarily at the audible level. I was unsatisfied with the narrative poles of electronic music — loop-based dance pieces or abstract/ambient pieces without storytelling force. A suite of rigorous modal improvisation in Arabic music called taqasims offered the solution: I knew and loved their internal play between free-flowing improv and strict technical guidelines. I spent a year or two translating these ideas into pieces for samplers and laptop. Two albums later I still wasn’t satisfied: one-way cultural flows aren’t good enough. I wanted community, two-way translations, the squeal of a feedback loop. Earlier this year I was commissioned by a British arts council to transform Nettle into a proper live ensemble. Violin, oud, percussion, electronics, realtime sampling. I’d been involved in Barcelona’s Moroccan music community for a while, but the Nettle project has upped the intensity of collaboration. A few days ago, Nettle’s violin and oud player, Abdelaziz Hak, brought up taqasims to explain his response to a beat I’d prepared for him. I broke into a silly grin. This is working. We’re starting to get under each other’s skin. When I met Judy Eissenberg last year and she told me about the MusicUnitesUS program & how she was inspired to start it in the wake of 9/11 as a way of embracing and exploring cultural difference, I almost immediately thought of Nettle. Whereas MUUS residencies in the past have offered an opportunity for intercultural exchange, bringing representatives of some ‘non-Western’ society to share their traditions with the Brandeis community, what is wonderful about Nettle is that the group already embodies that process of encounter and exchange. What especially attracts me to the group’s sound and spirit is their eschewal of easy fusion cliches, choosing instead to embrace moments where they “get under each other’s skin,” as Jace puts it. I’m further delighted to report that Nettle will be joined by their occasional percussionist (aka Filastine!) and visual artist Daniel Perlin (aka DJ N-RON!) who will be providing realtime visual accompaniment. It’s gonna be quite a show. If you’re in the Boston area (or not! ), you’re welcome to attend any of the on-campus events, which, aside from the concert Saturday night, are all free and open to the public. I expect tickets for the concert to go quickly, so you may want to snap some up ASAP. I’ll be giving a brief talk in the Rose Art Museum directly prior to the concert, exploring the ways music expresses selfhood and neighborhood in our globalized, if perhaps not quite (yet?) cosmopolitan, cities. Thanks for all of the efforts involved in making this show happen. I have not been this excited to see a show in a long time! Just for the record, I’m happy to report that the band has arrived in Boston. And although they had to remove their shoes several times and go through about an hour’s more rigmarole than most of their fellow passengers, Abdel & Khalid have safely crossed the border. Nettle is rehearsing together as I type this. So exciting! im royally frustrated: immediately, because im missing this frickin amazing nettle campus visit; and in general because i had to commence only a semester after you arrived. quick update: im in miami with raphy. workin. hard. the sound is pretty dope. very new-ish. random that this is my means of reaching out, but i am tryin to show some your page some love more often. im working on getting one of my own up you know. im working on a lot of things. lets catch up. thanks for the note, gabe. good to hear from you! can’t wait to hear what you and raphy are up to! wish you were here for nettle — they’ve been knocking my socks off.